The median sale price for homes, and the number of homes sold, were both up in February. The real estate market in the Madison area continues to heat up as winter turns to spring. Demand from homebuyers is high, and inventory remains low. That created a great market for home sellers in Dane County in February. The number of homes sold, and the median sale price, both continued to trend upward. 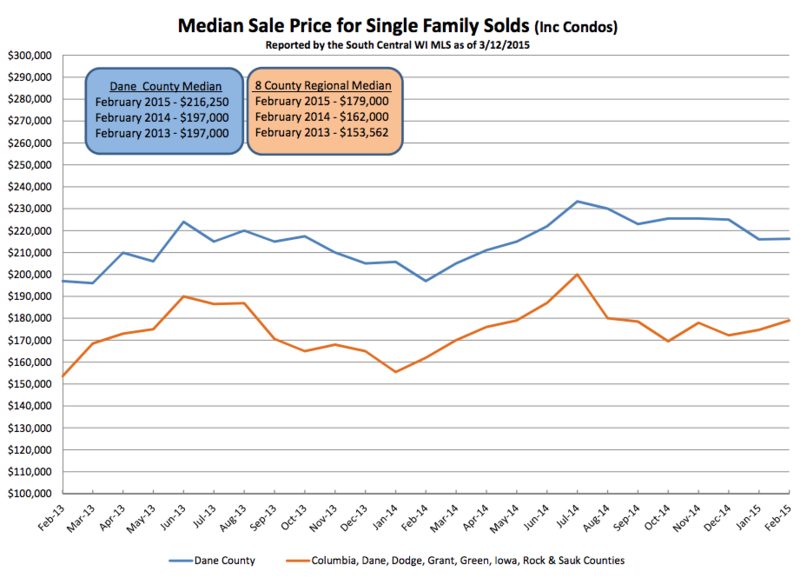 The median sale price for homes across Dane County hit a record high for the month of February. It settled at $216,250, a 9% increase over the same period last year, the South Central Wisconsin MLS reported. Motivated buyers and limited inventory could continue to drive higher sale prices in the months ahead. Higher sale prices didn’t turn those motivated homebuyers away last month, either. The number of homes sold in Dane County reached a seven-year high for February. There were 346 home sales reported, up 5.5% from the year-over amount. Overall economic conditions help explain homebuyers’ willingness to pay higher prices for homes. At the end of 2014, the U.S. unemployment rate was at its lowest level since 2008, and job growth was at its highest point since 1999. That means more people may be able to purchase homes. But overall wages dropped slightly in 2014, which could work against the housing market, according to a Keller Williams report. Single-family homes accounted for the bulk of home sales in Dane County in February. There were 280 single-family homes sold and just 66 condos. Condo sales were down 19.5% from February 2014 due to limited inventory. Just 155 condos were listed for sale in February, one of the lowest levels we've seen over the last 12 years. Overall, February ended with just 1,802 active listings in Dane County, a 20% drop from last year. A historical look at active listings at the end of February reveals just how limited inventory has become. In 2007, there were 5,128 active listings in Dane County at the end of February — that’s 65% more than we saw at the end of February 2015. “If you are considering listing your home in the Madison area, then now might be a good time because it may be worth WAY more than you think,” Josh Lavik said. New listings in Dane County were also lagging in February. Just 765 homes were listed for sale, a 7% drop from the year-over amount. Similar real estate market patterns emerged across South Central Wisconsin in February. Median sale prices increased 10.5% from last year to $179,000 in the eight counties that make up South Central Wisconsin. The number of homes sold across those counties was up 4%, SCWMLS reports. For information about current market conditions, or to discuss the right time for you to buy or sell a house, contact Josh Lavik & Associates at 608-620-4234.